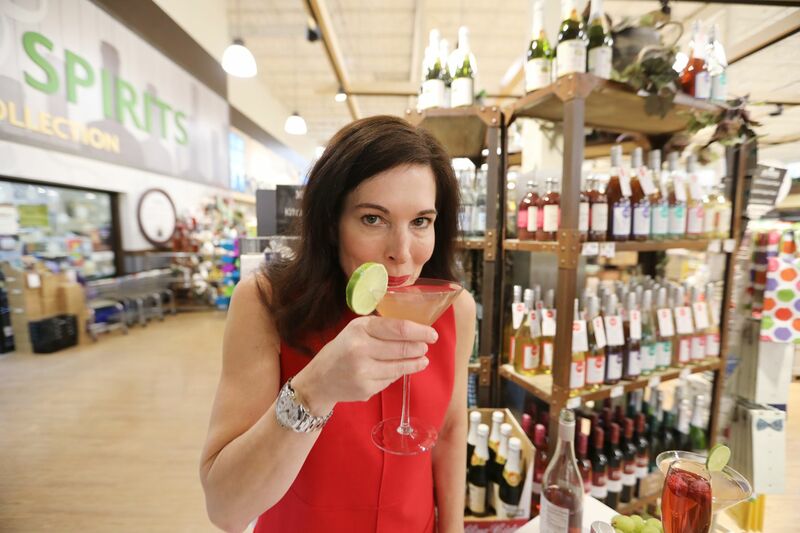 Laura Taylor, founder of Mingle Mocktails, with her alcohol-free libations at McCaffrey's Market in Blue Bell. As a graduate in industrial engineering from California Polytechnic State University, San Diego native Laura Taylor had two career aspirations: She didn’t want to be “a lab rat” or spend a lot of time in steel-toed boots. How that led to the now mother of two from the Main Line developing Mingle Mocktails, a line of nonalcoholic drinks, is a tale of corporate culture, changing consumer preferences, and a trait that the head of a local beverage distributor mentioned several times in describing Taylor: persistence. A heavy pour of it. ‘Everybody is down to not drink.’ Why young people are drinking less alcohol. Her journey to entrepreneurship in a market crowded with competitors specializing in water, juice, soda, tea, power drinks, and other alcohol-free beverages estimated to reach $190 billion by 2020 comes after numerous business functions where booze was as plentiful as business cards. Mingle Mocktails’ incorporation was the result of candid self-assessment by Taylor: “I think I’m drinking too much." Nonalcoholic options at corporate mixers and conferences weren’t just isolating, Taylor said. They were uninspiring. Taylor wanted to make nonalcoholic options at corporate events more exciting than water and seltzer. “When I put down the wine, I had to pick up seltzer or water,” said the veteran of Rockwell Automation, Accenture, IBM, and a high-growth data-visualization firm called Tableau. For the next couple of years she would drain countless two-liter bottles of seltzer as she conducted exhaustive online research on mocktails, which were trending along with coconut water and probiotic-rich kombucha, in part because of health-conscious millennials. Then came the “game changer" — a weekend in the Poconos with women from the neighborhood. Taylor knew alcohol would be on the menu, so she packed her own concoction. It’s now known in Mingle Mocktails parlance as the Cranberry Cosmo, a bubbly blend of cranberry, lime and orange juices, and organic cane sugar. “It was a literal ‘aha,’ ” she said. As she sipped from a wine glass, she felt “socially connected. Think of someone vegetarian at a barbecue restaurant being given something meat-free." Mix in a common ingredient in career unrest — insufficient recognition by the boss — and, six months after incorporating Mingle Mocktails, Taylor launched product in November 2017, generating $7,000 in sales by year’s end. She said she accomplished that by “hoofing it” in her spare time, while keeping the Tableau job until last month, taking her product to country clubs and specialty stores. Among the first to sign on was Carlino’s, a 36-year-old family-owned food market and caterer in Ardmore and West Chester, largely because Taylor is “really, truly passionate about her brand,” said Nick Carlino, chief marketing officer. And because her flavor pairings “are so good,” he said. “We go to the food shows around the country and we’ve noticed over the past two to three years, in particular, there have been so many companies that have started that do something similar to Mingle, but the taste isn’t there,” Carlino said. A 750-ml bottle retails for $8.99 on the Mingle Mocktails website. Taylor hired her only full-time employee — a salesperson — in May 2018. Beverage distributors helped expand Mingle’s reach. The drink is now in 400 Stop & Shop grocery stores in New Jersey, New York, Connecticut, Rhode Island, and Massachusetts, and, more locally, a variety of food markets, restaurants, and stores, including McCaffrey’s, ShopRite, Bed Bath & Beyond, Fleming’s Steakhouse in Radnor, Talula’s Table in Kennett Square, and Porta in Center City, and even a retirement community for happy hour. Sales for 2018 totaled $85,000 for a four-flavor line of Cranberry Cosmo, Blackberry Hibiscus Bellini, Melon Mojito, and Moscow Mule, according to Taylor. Mingle Mocktails are a blend of fruit juices and natural botanicals amounting to 40 calories per 8-ounce serving. More than $100,000 has been raised from friends and family to fund growth, said Taylor, who hopes to hit $500,000 in sales this year and wants revenues "exceeding $10 million” within five years. To get there, Taylor wants to partner with a major manufacturer of alcoholic beverages. Talks with one have proven a bit premature, she said. “I feel her pain because you’re up against the big boys — Coke, Pepsi — they control a lot of the market," said Tony Salvatore, chief customer officer of the locally based Hank’s Gourmet Beverages, makers of a craft soda line launched in 1995. “You have to find your niche and if you’re Philly, you have to keep the ties to Philly, really push that Philly end of it, because Philly people love that." In that vein, his company has partnered with Campo’s Deli on a cheesesteak with a rub and marinade made with Hank’s root beer, available all month to commemorate National Cheesesteak Day, March 24. Campo's Deli and Hank's Gourmet Beverages have partnered on a cheesesteak made with a sweet-and-spicy rub and marinade made with Hank's Gourmet Root Beer for a monthlong commemoration of National Cheesesteak Day, on March 24. Andy Cimochowski, president of Metro Beverage of Philadelphia, one of Mingle Mocktails’ distributors — “She was very persistent” — has handled some mega-brands in the soft-drinks arena, including Fuze, Arizona, and SoBe.